The video at the end of this piece is significant for several reasons. 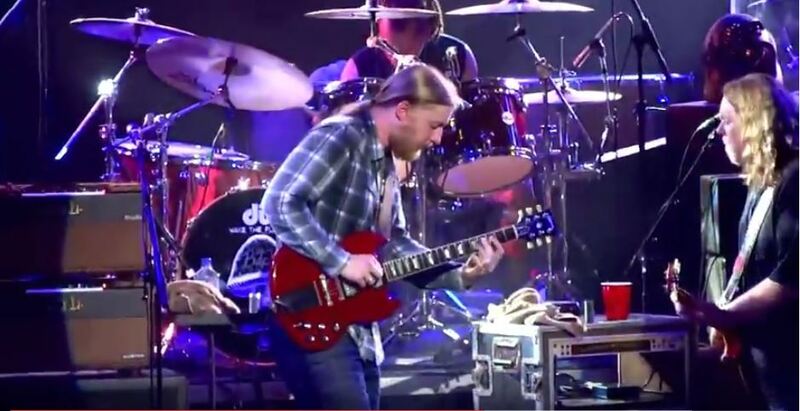 In the video is Warren Hayes fronting the Allman Brothers at the the Merriweather Post Pavilion in Columbia, Maryland in 2013. At his right hand playing slide guitar is Dereck Trucks, the son of the long time Allman Brothers band member, Butch Trucks. This is classic Allman Brothers – a laid back, Southern fused, blues/rock jam – and the song is Good Morning Little School Girl, an old blues staple from the 1930’s. Some groups and some songs are timeless, and this video is the marriage of a timeless Allman Brothers song and a song. But we haven’t gotten to the real significance of the video yet – significance in the history of the Blues and significance for the Fox Valley. Good Morning Little School Girl is one of the better known songs recorded in the Sky Club at the top of the Leland Tower in Aurora by John Lee “Sonny Boy” Williamson in 1937. The song, originally called Good Morning, School Girl, and those recordings In Aurora helped catapult Sonny Boy Williamson to legendary status in music history. “The music created at the Leland became known as the Bluebird beat, considered to be the precursor of the urban Chicago blues.” Part of the Fox Valley Music Foundation mission is capturing and preserving that history. Sonny Boy Williamson, like many of the Chicago Blues artists, had roots in the south. He was born in Tennessee, and many of the artists who recorded those Leland Tower songs were originally from the south, including Big Joe Williams (Miss. ); Robert “Nighthawk” Lee McCollum (Ark. ); William McKinley “Jazz” Gillum (Miss. ); Henry Townsend (Miss. ); James “Yank” Rachell (Tenn.); Tampa Red (Georgia); Big Bill Broonzy (Miss. ); Robert “Washboard Sam” Brown (Ark. ); and more. In the video is the classic Southern Rock/Blues band, the Allman Brothers, playing a modern version of southern influenced classic blues song that shaped the sound of Chicago Blues in the decades following the Leland Tower recordings. What goes around comes around is a truism that fits the story. In The video is a mixture of old and new, a song with southern country/blues influence that epitomizes the Chicago blues sound, a modern Southern Rock group playing an old Chicago blues song. And there are more circles to be completed. Dereck Trucks, who is the progeny of Allman Brothers legend, Butch Trucks, playing slide on the song in this video, is coming to Aurora in June to headline Blues on the Fox, the annual festival that was inspired by the Leland Tower recordings that introduced Good Morning, School Girl to the world. The Tedeschi Trucks Band will take the stage on Saturday June 18th, finishing off a great weekend of Blues and celebration of the Blues history that was made right here in the Fox Valley, and it is only fitting that they will do it in Southern style.